Your new puppy is so cute. He’s fluffy, and friendly, and playful…and he keeps urinating on the kitchen floor. You’ve rubbed his nose in it, taken him outside repeatedly, and tried to confine him to the kitchen when you’re not around, but the puddles continue. What do do? This, my friends, is Housebreaking 101, also known as Crate Training Boot Camp. I’ve successfully housebroken several of my own puppies, who are now adult dogs that are completely accident-proof. I even successfully housetrained my eight pound Chihuahua, which some say can’t be done. After seven years of counseling my clients on how to improve their puppies’ bathroom woes, I have lots of experience on this topic! With the right plan, and a lot of consistency, you, too can have a perfectly housebroken little Fido. The first step is to acquire a crate for Fido. 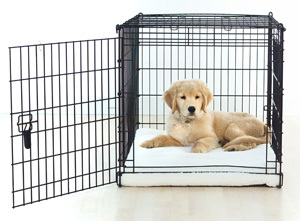 The idea behind crate training is that we are recreating a den-like environment for your puppy, where he will feel safe and secure. 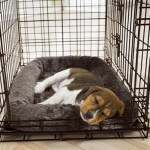 Dogs have a very strong instinct not to eliminate in their “den”, or crate as the case may be, so crate confinement is immediately going to reduce the number of accidents. 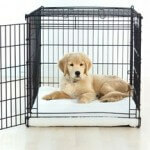 The crate is NOT a place for punishment, and should only have positive associations for Fido. Give him treats and toys whenever he’s in the crate, and never use it for “time-outs” or punishment if he’s misbehaved. The crate should only be large enough for Fido to lie down and turn around; the bigger the crate, the more apt Fido is to have accidents in it. 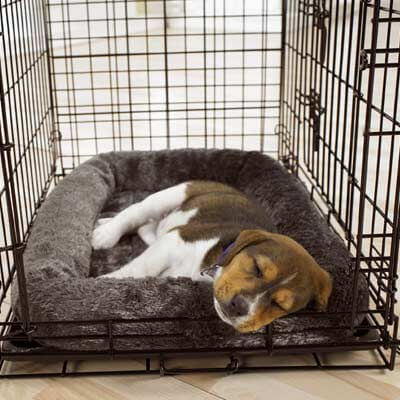 If you find that Fido repeatedly eliminates in his crate, insert a divider to narrow down the size of the area in which he sleeps. Smaller crates are better for dogs who continue to have accidents in them. If the crate has been narrowed in size, and Fido still eliminates in there, I often suggest removing any bedding (towels, blankets, newspapers) as these can serve as a desirable substrate on which Fido will eliminate. Now that Fido has a comfortable and appropriately-sized crate, he should be kept in it any time you are not physically observing him. Even if you are home, but sitting down with the family at the dinner table, or in the shower, Fido should be in the crate at those times. The rule is: unless your eyeballs are directly on Fido, he should be in the crate, even if it’s only for a few minutes. The next rule is: any time Fido has been in his crate, he needs a trip outdoors to go to the bathroom before he’s allowed in the house. Think of it this way- the intent of the crate is to teach Fido to hold his urine; after spending time in the crate, he then needs a consistent and immediate opportunity to relieve himself. I think this is one are where owners are often inconsistent, particularly if younger children are helping with Fido’s care. Ensure that everyone in the home follows this rule! 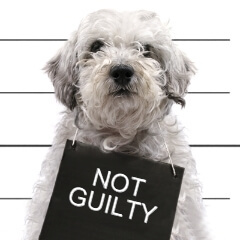 After Fido has been in his crate, take him out on a leash for a potty break. If he eliminates outside, immediately give him a high-value food treat (you may need some trial and error to determine which treats Fido is enthusiastic about) and regale him with praise. Couple the treat and praise within a second or two of completing the act of urination or defecation. If Fido gets a treat when he comes back inside, he thinks he’s getting a treat for entering the house, not for going to the bathroom! If you take him outdoors for a reasonable about of time, say 5 minutes, and Fido does not go to the bathroom, then bring him inside and immediately put him in the crate. Try again every 15 minutes until he goes. Remember, if Fido hasn’t eliminated outside, he’s a loaded weapon and could go off at any time in your house. The way that Fido earns some freedom in the house is to go to the bathroom when you’ve expected him to. After Fido has done his business outside, you can relax a bit and have fun with him outside of the crate. However, this doesn’t mean that Fido should have the run of the house. Fido should only ever been in the room where you are, so you can closely observe him. Close doors, put up baby gates, or tie Fido to your waist with a leash if you need to. If Fido leaves your sight lines for even a moment, he may leave you an unexpected “present” on the living room rug. If you catch a glimpse of Fido urinating or defecating in the house, make a loud noise by stomping your foot or clapping your hands to startle him. Then pick Fido up and rush him outside to complete the act. If he eliminates outdoors, reward and praise him lavishly. 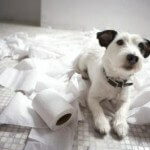 If you come upon an unexpected Fido “present”, clean it up and go about your business. If Fido has an accident, it’s not his fault, but ours because we obviously allowed our minds to wander and weren’t paying adequate attention! It’s also essential to know Fido’s “danger zones” when he’s more apt to be stimulated to go to the bathroom. Napping and sleeping, vigorous play, eating and drinking can all be triggers for Fido to urinate and/or defecate. Preempt any accidents by taking Fido outside immediately after he wakes from a nap, in the midst of a play session, and 20-30 minutes after he’s eaten. Typically, a dog is not considered housebroken until he goes 30 days without an accident. If Fido doesn’t have any accidents for an entire month, then can you consider easing up on some of the restrictions described above. Many owners elect to keep dogs in their crates well into adulthood; not only do crates provide an excellent tool for housebreaking, but they also keep Fido safe so he won’t chew your woodwork, shoes, electrical cords, etc, while you are out of the house. 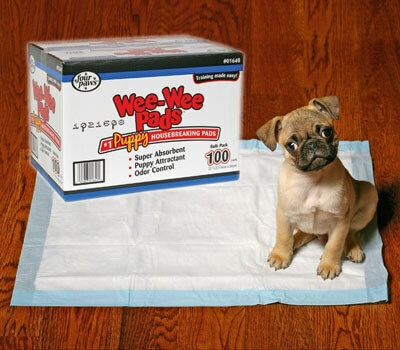 A word about wee-wee pads: they are emphatically discouraged by veterinary behaviorists and other canine experts. 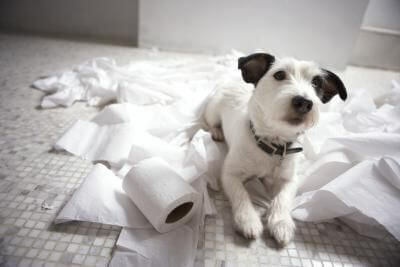 If your goal is for Fido to eliminate entirely on wee-wee pads, into adulthood, and never go to the bathroom outside, then by all means, train him on the pads early. However, in my experience, the vast majority of owners want Fido to eliminate outdoors by the time he’s an adult. 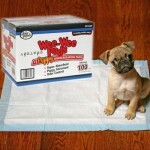 Wee-wee pads create confusion and unnecessary complication when housetraining. Dogs often have trouble understanding that it’s ok to eliminate in this corner, with the wee-wee pad, but not in that corner, where the rug is. Trying to teach a dog to eliminate indoors and outdoors at the same time is more than most dogs (and owners) can handle. Toss those pads, get Fido a crate and begin Housebreaking 101! You will have success if you stick with it. And invest in a bottle of Nature’s Miracle, for those occasional lapses in judgement.